John and Melisa met on her first day at work, they were dating a little over a year before they got engaged. When they met they instantly knew they were soulmates, Melisa said, “We knew from Hello”. For their proposal, they had a date to the very same restaurant and table of where they had their first date, where John popped the question. . While planning a local wedding they realized they would have to invite too many people, it simply wasn’t feasible. 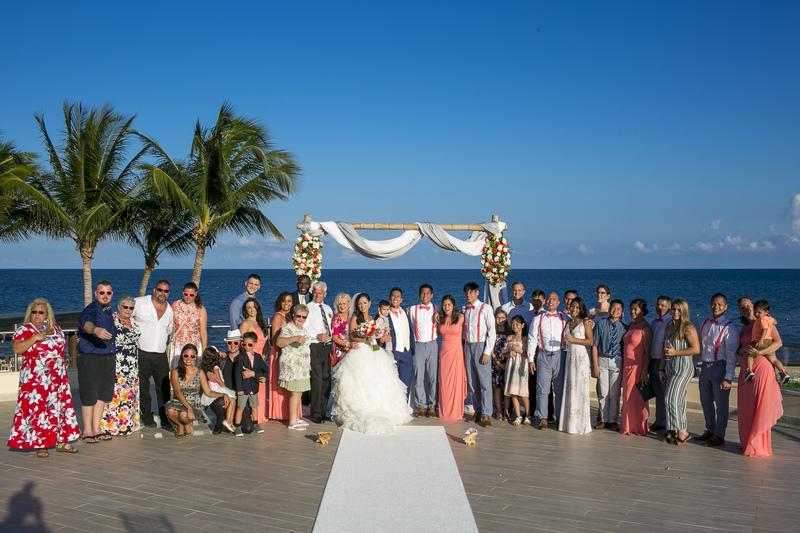 They chose a destination wedding because it would be a smaller tight-knit group of their loved ones. They wanted Mexico because it was the place where they had their very first vacation. The couple worked with Destify agent Maddy, who helped to book the travel and room accommodations for over 40 guests. They chose Dreams Riviera Cancun, a beautiful family-friendly resort outside of the hotel zone in Cancun. The couple stayed 5 nights and most of their guests stayed 3 nights. Before the ceremony, the couple and their bridal party met briefly at their venue to go over last details. On the day of the ceremony, it was actually John’s birthday too, so everyone met in the morning for a birthday breakfast. After, the couple split at 1 pm to get ready. The couple held their ceremony at 5 pm on the stunning rooftop terrace, with views of the ocean in the background. After, the couple took photos and then met their guests at a cocktail hour. The couple then held a private reception in the ballroom, which featured cocktails, delicious food and dancing into the night. Melisa said, “Many of our guests had never been out of the country before, it was really special”. The couple had so much fun they’ll be hosting another trip every three years. Melisa’s advice is that having a destination wedding is totally worth it, but to have patience as you may experience longer wait times when communicating with coordinators who work in another country. When you get there it’s far better then you could ever imagine.